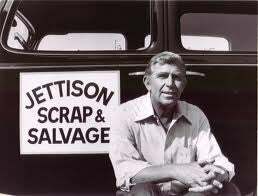 In the 1979 made-for-TV movie (and subsequent short-lived series), Salvage 1, Griffith played Harry Broderick, owner of the Jettison Scrap and Salvage Co. His ambition is to recover equipment left on the moon following the Apollo missions. He builds a spaceship he names the Vulture—made entirely of recycled scrap, of course. It is fueled by a unique substance called monohydrazine. And that’s where Andy’s secret lay. Everyone knows that escape velocity is the speed you need to be going in order to break free from earth’s gravity. About 7 miles per second, to be exact. Newton figured this out 400 years ago. According to NASA, "escape velocity is the speed needed for an object to break away from the gravitational pull of a planet or moon and leave it without further propulsion." A spacecraft needs to be going 7 miles per second, or nearly 25,000 miles per hour, to leave the earth without falling back to the surface or falling into orbit. The key word is “projection.” Escape velocity really refers to the initial speed an object needs – that is, as if it were being shot out of a cannon (which was what Newton was thinking). A rocket acts almost as if it were shot from a cannon since it must expend its fuel in such a short amount of time. This is because the slower it travels the more fuel it has to burn, and the more fuel it has to burn the more it has to carry (step rockets were invented to get around this problem). Getting up to speed as quickly as possible is the most efficient thing to do. But the last part of the NASA explanation gives a clue to what Andy discovered: if you have a fuel that contains so much energy that it can provide a continuous thrust for a very long time, yet add no more weight to the rocket than ordinary fuels, you can escape into space at much lower speeds. In fact, with the right fuel (albeit an entirely imaginary one), you could travel to the moon at a leisurely 50 miles an hour. In fact, if you had a sidewalk long enough, you could walk to the moon. While a sidewalk into space probably isn’t practical, that’s essentially what a space elevator is. And a space elevator might be perfectly practical. By tying one end of a cable to the earth and the other to a geosynchronous satellite, a solar-powered elevator car could travel to an orbit 22,000 miles above the earth at any speed it likes.